Only a humorless scold would get upset over something like this. The acceptance of taxpayer dollars equals the forfeiture of free speech. Democrats should be careful with that rule, considering their policies. Missouri Governor Jay Nixon called it “offensive.” He perhaps should have appointed a different Fair board and Director of Agriculture, who works with the Fair board. If Democrats are angry, they should look inward. Fun fact: seven of the eight board members were appointed after Nixon took office. Missouri’s Republican Lt. Governor Peter Kinder demanded that someone be held accountable. Here’s a newsflash for these blowhard politicians. Barack Obama was not in the ring. No one was talking about flying a bull to D.C. to attack him. No threats were made against Barack Obama. It was just some people having a little fun and Barack Obama was mocked in the process. To liberals, this isn’t allowed and because it isn’t Saturday Night Live, Jay Leno or David Letterman making fun of Obama, they think they can get away with silencing them. Maybe they’re right about that. 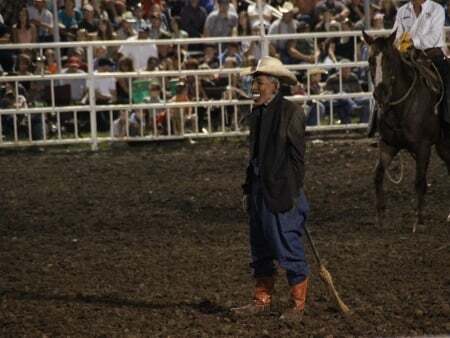 After all, you’ve got a senator and a governor going after a clown or some other designated fall guy at the rodeo. Well, they may be able to shut that guy up, but they can’t shut us all up. There are an army of Americans that know the empire has no clothes and we’re going to keep on making fun of Obama and there’s not a damn thing Jay Nixon, Claire McCaskill or any other Democrats with sticks up their behinds can do to stop us.